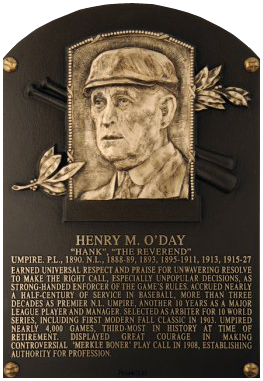 Comments: On Dec 3, 2012 Hank O'Day was elected into the Baseball Hall of Fame. He was a strong candidate for several years but I didn't pick up the message. So, I didn't own a single card of his. In January, 2013 I picked up a tribute card - a 1994 Conlon #1201 off eBay for $5.99 including S&H from seller cassandt. 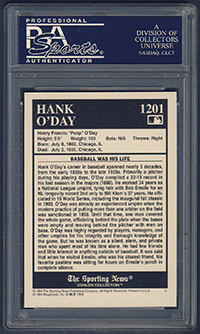 A month later I bid on a circa 1889 Hartley Studio Cabinet card of O'Day, from his playing days, in the Feb, 2013 Love of the Game auction but came up short. Anyway, I received the tribute card and it looked mint with centering off left to right. 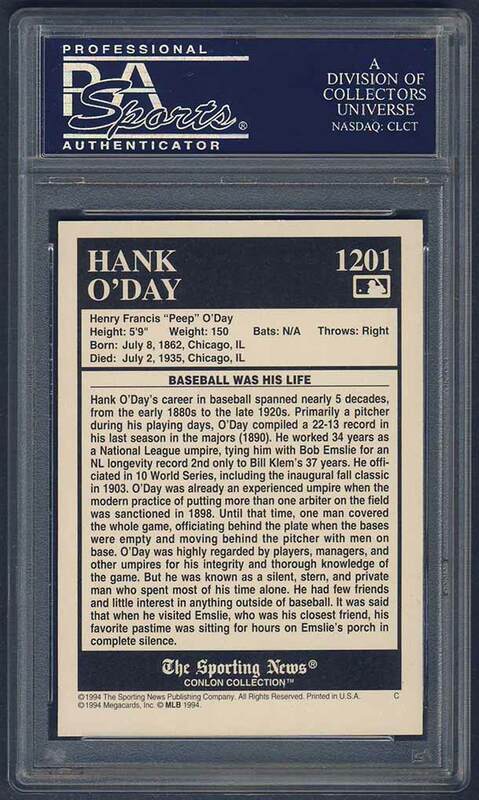 In late May, 2013 I sent PSA a group of 175 raw cards that I had purchased at shows and on eBay over the course of several years ((including this O'Day) for grading/authentication. I waited two plus months for the submission and during that time decided to have a little fun. Normally, I get the email from PSA indicating grades are available and I go online to review the results. When I receive the package I open it up look through the cards and start the scanning process. The entertainment ends there. This time I decided to do things a little differently but it would take extreme discipline. I didn't go online to look at the grades and the package arrived for pickup on August 23, 2013. I asked my wife to open the box and randomly distribute the contents into a large storage bin. The bin went into the closet and each day for the next 6 months my kids would take turns pulling out a card for me. One card at a time, it was like Christmas every day. I'm involved in a private chatroom of sportscard collectors where I would post a picture of "The Card of the Day" for the guys to follow along. The kids loved it too! This '94 Conlon was Day #085 I blew it on this one. Upon closer inspection there's a very, very slight crimp in the lower right corner (not visible in scan)....so, will need to keep looking. There's one raw example on eBay right and seller scotgreb has a PSA 8 for sale. But, I want a 9/10 on this card. I'll need to purchase it in person (National?) so I can scrutinize it more and ensure high-grade. The black or maroon borders (depending on version) make it condition sensitive. UPDATE: In late November, 2013 one of my hobby friends send a PM with the following message: "Hi Mark! I think I have a couple of unopened 1994 Conlon sets sitting around. Want me to look through them or just send them to you for you to cherry pick? They're just collecting dust here!" I took him up on the offer and he sent me two. I'll be submitting them soon. Thanks JVB! Description: The production of "old timers" cards based on the photography of Charles M. Conlon from the 1910s through the 1930s continued into a fourth year in 1994 with another 330-card series, numbered 991-1320. Once again the format of previous years was continued. 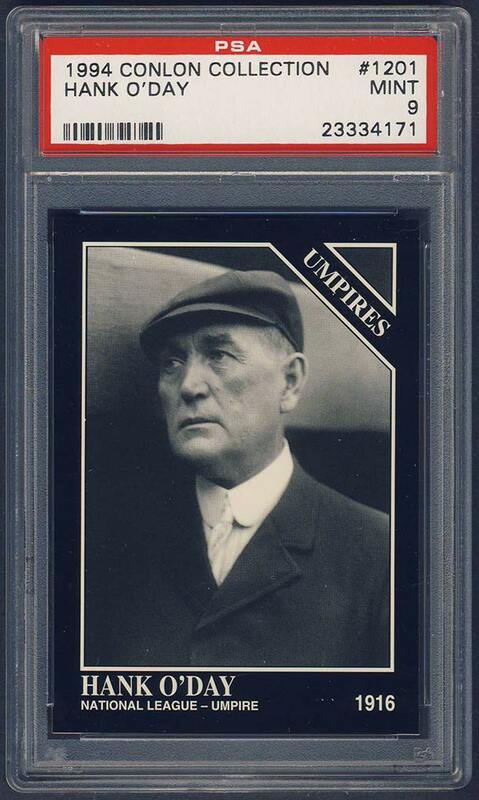 Subsets included the 1919 Chicago White Sox, major league brothers and action photos.